We can remove your cover from your home and store it at our warehouse facility. We will also clean it off and let it dry before long term storage. De-winterize pool equipment and start system. Please make sure your water level is higher than normal when we arrive so that we can vacuum the dirty pool to waste. IMPORTANT – Each pool opening is different and we are not guaranteeing that your pool will be clean and clear when we leave. 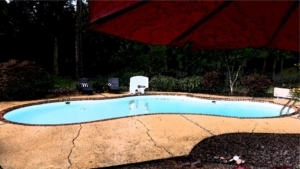 Many different factors play into the condition of a pool after an opening, (How it was covered, condition upon closing, winter temps, winter maintenance, etc.). If you are not happy with the condition of the pool your can always purchase additional cleaning visits and chemical to get the pool to a swim-able condition.